A very dear friend I never met passed away on Friday. Her name is Barbara Bradley. I am absolutely heartbroken about losing her. How could I consider someone I never met a dear friend? One of the many rewards of running this blog is that by the simple act of corresponding, I have come to know a great many people all over the world. What begins as an exchange of information relevant to a topic of mutual interest evolves over time into a more personal exchange... and after a while, a genuine friendship blossoms. What's most interesting about this sort of relationship is that, because we have never met in person, our impression of the other party is based on our conversation. Similar to what you might experience by listening to a radio personality... or from speaking to a client or coworker who is just a disembodied voice on the phone in another place far away. Over time you begin to paint a picture of that other person in your mind based on their words and the stories they tell you about their life. To those many people who were fortunate enough to enjoy Barbara in person she was a teacher, a mentor, a friend, perhaps even a surrogate parent. After many email exchanges and many anecdotes related, I pictured Barbara Bradley as a bright-eyed young woman, fresh from art college, filled with the energy and enthusiasm of a newly minted professional illustrator. I imagined her working at 136 East 57th Street, The Charles E. Cooper Studio, looking down on the noise and bustle of the 1950's New York City streets. A fellow Art Center graduate, who had got started at Y & R a few months before we arrived in NY, gave me a list of the ten top studios. I figured I'd let Barbara (like water) settle at it's own level so I'd start at the top, work down getting turned down, and settle where I stopped. The top, Cooper's, didn't interview until Thursday, so I had all week to get turned down before settling. Except I didn't and I saw the worst and the best. I remember that one on the list offered me a job, and pointed to a bunch of telephones with womens' heads and arms on them, pointing out with great pride that these had all been produced in their studio. I was also assured that they expected to get out of me every penny they were paying. Yes, I did go to Fredman Chaite, #2 on the list. I would have accepted their position but couldn't until I'd seen Cooper's. Then Thursday and Coopers. I didn't expect anything... only hoped. However, Chuck liked what he saw! I was almost broken-hearted when he told me that he just didn't want to hire any more women artists. ( I never learned exactly why but gathered that another one had caused the studio some trouble). I assured him, to no avail, that I emptied waste baskets beautifully and cut a mean mat. That was the worst moment I'd ever had or would have because I was a woman. So, with hanging head, back to our telephone-less hotel. The next morning brought a telegram, asking me to come in on Monday. New artists usually worked in the "Bull Pen", matting art for about 6 months. I spent one morning there. Though I cut very presentable mats, I lacked an authoritative style. Chuck Cooper kept checking to see how I was doing. My mat-cutting made him so nervous he put me on the board that very afternoon, not on the floor with Cooper's greats but still on the board. A few weeks later, I made the big move... into Joe De Mers just vacated studio/office. He moved into a larger room, just adjoining. Wow! Into the office just vacated by a god. I thought maybe something great would happen by osmosis. It didn't, but I plugged away, trying to get that wonderful easy paint quality that so many Cooper artists had. I flunked my first job there. It was a black and white spot, one most of the artists could have done with their wrong hands. I studied too many B & W styles and made a mish mash of it. Chuck was understanding. He realized what I could probably do better and gave me a full page color job of a bunch of Woolworth dolls. From then on, I did fine. My salary was doubled in a month. That's how I got started at Cooper's. "Joe De Mer was responsible for the biggest jump in my art that I'd ever taken. First, a little background. My husband and I had gone to Art Center together, he an advertising major and on the GI Bill. Well, we stretched his supply allowance at the Store to last us both which got me in the habit of being very paint frugal. Coopers' covered all of our art supplies but the habit continued. Well, Joe came by one day as I was getting ready to paint. Joe, "What ARE you doing?" Me (small voice), "I'm putting paint on my palette". "Here". with that, he took a tube of designers and went splat, squeezing out what I would have considered a month's supply. If god says "splat", I'll go splat. I did and my technique jumped 200 % in one afternoon." Isn't that fantastic? There are so many more, some that you've already enjoyed during that week when we looked at Barbara's career, others that were set aside for future topics, even more that she deemed "not for the blog" because they were dashed off on the spur of the moment and didn't meet her high standards of writer's craft. I must tell you, for those of us who are more than curious about the illustration business of the mid-20th century, Barbara's stories, shared so generously, are like treasures that would otherwise have been lost forever. Now there will be no more stories. There will be no more anecdotes. I feel guilty not having made any comments in the last few weeks. You've been running some fascinating work, much of which I love and much of which I admire. These last weeks have seemed so filled, not because there has been too much to do but because I have become so inefficient, pooping out far too early in the day to accomplish much. Please don't bother to answer this. I wanted you to know that I am alive and enjoying the blog. You've got too much on your plate. Thank you for your good works. Thank you Barbara, thank you for your good works. Goodbye, dear friend... I will miss you. What a warm and wonderful tribute. This, to me, is the beauty of the net--it's ability to enable and deepen real personal relationships that enrich all of us. This is so sad. I thought it was so nice that she shared your enthusiasm about Al Parker, and when I read the note she wrote you I thought that it seemed like a sweet friendship for both of you. Even though you never met in person, you shared things that were important to you. I'm sure your interest in her life and art meant a lot to her. I'm sorry about your friend. Also, I loved the 'People Send Me Stuff' post. Speak from your heart and the words will flow like melting mountain snow in the spring. I knew you would find the right words to say goodbye to Barbara, and you most certainly did. Thank you for a beautiful farewell tribute to a wonderful friend, illustrator and one of my first illustration teachers. really sorry to hear about this, Leif. I really wasn't aware of her until I saw your postings over on Flickr. I loved her stuff (especially her ability to draw kids convincingly) and I was really pleased that you brought her to my attention (at least indirectly). I'm really sorry that she's gone. Leif, your lovely tribute and your previous posts about my mother are priceless gifts which my sister Glennis, my brother Andy and I will always treasure. Although I knew a lot about her professional life, and had learned even more during the last year when she was honored by the Society of Illustrators, you have helped me to know her even better. How ironic that you two never met; I know she thought very highly of you. Please accept my sincere thanks and condolences. It helps to know that we are not alone in our grief. She impacted so many. Thank you for kind words Leif. I was lucky enough to work with her the last 5 years. We will miss her here at the Illustration Dept. Thank you for your wonderful tribute to Barbara. She was a remarkable person that I was fortunate enough to know for over 30 years. She retained that bright-eyed youthfulness you mentioned in your article. Her enthusiasm for life and even the smallest things was boundless. She was a master artist, an inspirational teacher, and a dear friend. I am so grateful to have known her and benefited from her teaching and friendship. I will miss her more than I can express. Thank you for your articles on her and this last tribute. I was one of the fortunate to have had Ms. Bradley as a teacher and as the head of my school's Illustration Department. She ran it with a steel fist and we all benefited richly from it. She knew coddling would bring us disappointment and brutal honesty would bless us with a career in our beloved chosen field. She helped so many students in a personal manner and was instrumental in placing many students in influential long-term career positions. I also was lucky enough to have been one of Barbara's students and I consider myself blessed to have been in those tough classes. She reduced me to tears more than once but I know that she did it because, as les toil said, she believed in total honesty. And I benefited from it richly. I had recently been back in touch with her via email and it was a terrible blow to hear that she had left us. She was a bright light in the world, but she passed that spark on to hundreds of students over the years. I teach now too and I think of her often. Sometimes I even make 'em cry. Leif-Thanks for the tribute to Barbara. She was my first real art teacher after high school. I had her as an instructor several times while at the Academy. I did well in her figure drawing classes, not as well in her illustration classes. She was sweet, yet demanding at the same time. She also kept us informed of the great work of illustrators of the past. I'd have never known about Al Parker, Robert Fawcett, Bernie Fuchs etc, if not for Barbara. 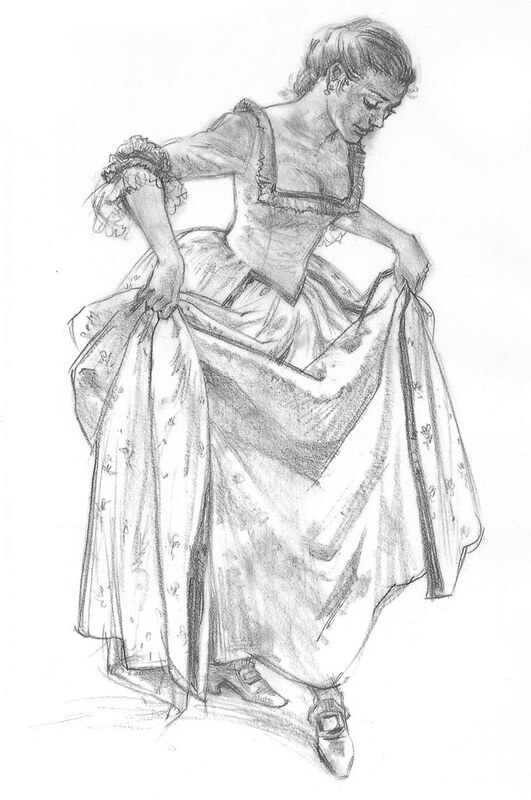 I was in Barbara's final clothed figure drawing class before she retired. I was probably one of the least advanced students in that class but Barbara never made me feel that way. She did quite the opposite in fact taking extra time with me to help get me up to speed. I only knew her for a very short amount of time but I feel absolutely blessed to have benefited from her immense body of knowledge and generosity. 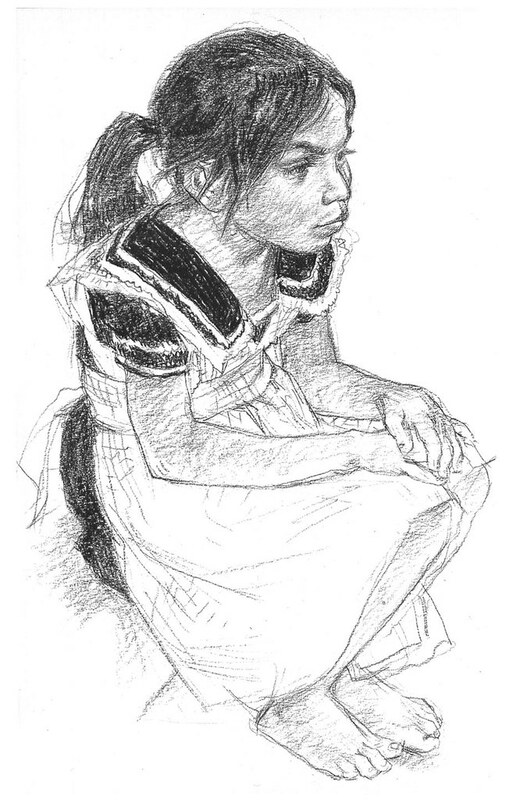 I absolutely love her book Drawing People: how to portray the clothed figure. When I googled her name to find more info or books I found out that she died. Now I feel like I missed out on something really special. I really wished I was able to go to at least on of her classes. Thanks so much for sharing! This way she never really "died".